The North Rebel 2013 is the definitive free-ride universal kite. The 2013 Rebel still remains North’s flagship kite, combining all the ingredients you need to cover a huge wind-range, rip apart any size surf, boost huge airs and ride comfortably in nearly all conditions. It is quite simply North's best interpretation of what a modern free-ride/wave kite should be and it’s really no mystery why the Rebel is THE most sold kite ever.Upwind of the Rebel is outstanding, still used by some of the North race team on the World Tour for course racing! For 2013, the Rebel incorporates a new strut concept, which combines the responsive turning and softer feel of three strut kites with the superior stability of a classic 5-strut design. The front sections of the struts feature an increased diameter towards the leading edge and then taper towards the trailing edge of the kite. This radically reduced diameter leads to more flexibility while the front part of the struts remain super stiff and strong for great stability. 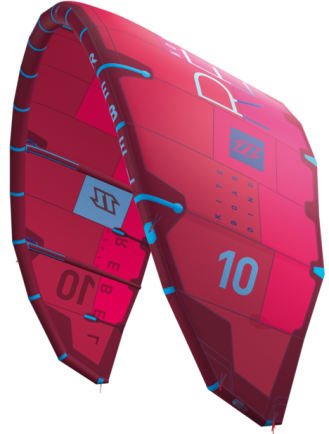 The flexible back section of the strut allows the kite to twist over the entire profile when sheeting in and out. As a direct result, the kite is able to generate better low end and a more responsive turning. In order to improve top end, North flattened the canopy profile towards the tip and quarter struts of the kite. This also gives less drag, less luffing and less flutter. 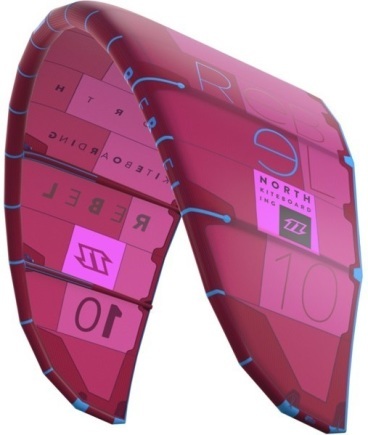 The 2013 North Rebel remains a loaded 5th line kite, offering its most acclaimed performance attributes like a short bar stroke, crisp, direct feeling, rock solid stability in all conditions, and it’s unique ability to steer while depowered. The square wingtip design maximizes the effective tip area, makes the tips less prone to distortion and fluttering while steering and gives the Rebel its new stylish and modern appeal. Super clean tip panels account for greatly improved, ultra smooth turning and easy handling that remains smooth even in over-powered conditions. The Rebel is a fast reacting high-performance kite. It offers good flight performance because its great glide phase after an explosive lift. The kite turns around its tips (tipturn), but its fast steering reaction counterbalances his wider turn. The Rebel's windrange is pretty impressive: it's good on both low and high end. If you're considering buying one: choose the 10m if you're above 80 kg and the 9m version if you're 75 kg or below. Your wind range (depending on your board volume) will be something of around 10 up to 20 knots. 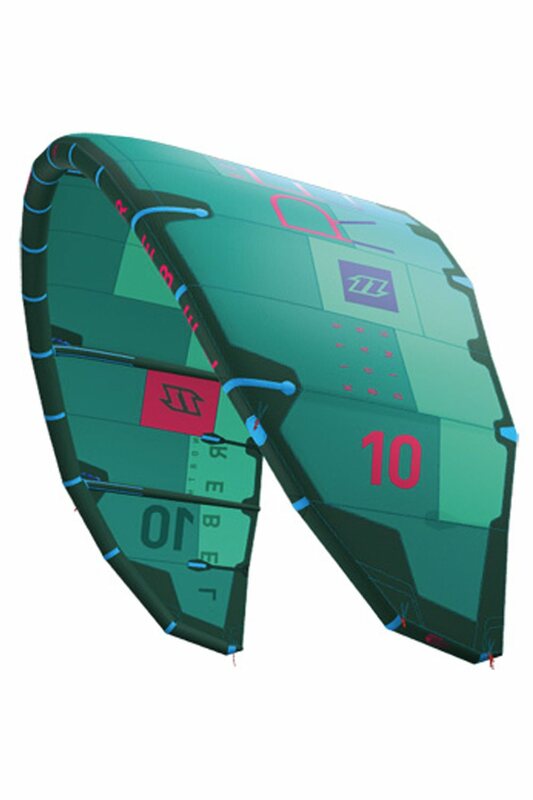 However, don't forget this kite is high performance because of its fast reaction, explosive lift and sensitive feedback. You can alter the kite feel settings, but it will remain sensitive. If you prefer a lot of feedback, the North Evo is probably your best choice from the entire 2013 North Range. If you're looking for a freestyle kite with characteristics like a lot of pop and unhooked characteristics, try the Vegas. All in all, our best advice to you is to choose 2 or 3 kite characteristics you value most in a kite and take these as the starting point in your selection process and/ or simply use our kite character sliders on the kitefinder frontpage and you'll get a selection of kites suitable for you! See here the experiences of other Rebel users. Great lift! Wide wind window so less float in < 18 knots (93 kg rider), but easy to go upwind. Not a lot of boost so no surprises. De North Rebel 2013 is een uitstekend afgewerkte kite, zoals je van North mag verwachten. De prijs is er dan ook naar, je krijgt wel veel waar voor je geld. De kite is makkelijk te hanteren, ook voor minder ervaren kiters. 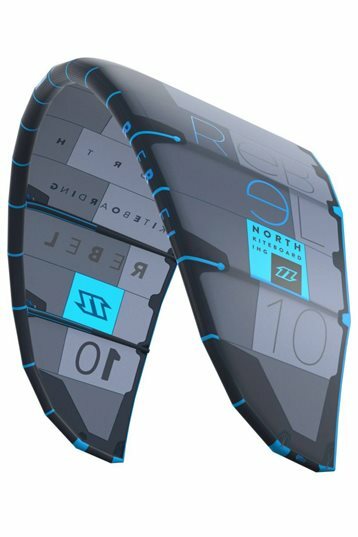 Ik heb vele North kites gehad, dit is toch wel de beste kite die ik tot nu toe gehad heb. Love the relaunch, pull on the steering line and up. Great low and high- end, overall big windrange. Didn't like the bar pressure, hard to feel the kite but changes the settings, I recommend others to experiment with the backline settings, it makes a big difference. Because of its lifely characteristics a nice kite for advanched riders who like to slide & glide. I like to see the new rebel as a all rounder. It got great characteristic, lots of them are in the green zone. Like the wind range, good low end and great control and lift in its high end. Feedback can be light but changeable to a more heavy setting with more feedback, I think that's a must to do and the only item for the next Rebel. The new bar is very nice, lots of new practical features. Changing the bar end is possible with the kite in the air, takes a little bit of practice but a nice job of the north R&D team. Tested with the 22m lines. For the fun I will try the 27m because I think it would be great for big airs. Liked it! Nice kite.